This article is about the railway line in the UK. For the former train operating company, see Midland Mainline. For other rail lines, see Midland Line. East Midlands Trains HST at Tupton, nr Clay Cross. The Midland Main Line is a major railway line in England from London to Sheffield in the north of England. The line is under the Network Rail description of Route 19; it comprises the lines from London's St Pancras station via Leicester, Derby/Nottingham and Chesterfield in the East Midlands. Express passenger services on the line are operated by East Midlands Trains. The section between St Pancras and Bedford is electrified and forms the northern half of Thameslink, with a semi-fast service to Brighton and other suburban services. A northern part of the route, between Derby and Chesterfield, also forms part of the Cross Country Route operated by CrossCountry. Tracks from Nottingham to Leeds via Barnsley and Sheffield are shared with Northern. East Midlands Local also operates regional and local services using parts of the line. ✪ Nottingham to London St Pancras, Drivers Eye View | Class 43 HST! The Midland Main Line was built in stages between the 1830s and the 1870s. The earliest section was opened by the Midland Counties Railway between Nottingham and Derby on 4 June 1839. On 5 May 1840 the section of the route from Trent Junction to Leicester was opened. The line at Derby was joined on 1 July 1840 by the North Midland Railway to Leeds Hunslet Lane via Chesterfield, Rotherham Masborough[n 1], Swinton and Normanton. On 10 May 1844 the North Midland Railway, the Midland Counties Railway and the Birmingham and Derby Junction Railway merged to form the Midland Railway. Without its own route to London, the Midland Railway relied upon a junction at Rugby with the London and Birmingham Railway line for access to the capital at London Euston. By the 1850s the junction at Rugby had become severely congested. The Midland Railway employed Thomas Brassey to construct a new route from Leicester to Hitchin via Kettering, Wellingborough and Bedford. giving access to London via the Great Northern Railway from Hitchin. The Crimean War resulted in a shortage of labour and finance, and only £900,000 (equivalent to £84,330,000 in 2018) was available for the construction, approximately £15,000 for each mile. To reduce construction costs the railway followed natural contours, resulting in many curves and gradients. Seven bridges and one tunnel were required, with 60 ft cuttings at Desborough and Sharnbrook. There are also major summits at Kibworth, Desbrough and at Sharnbrook where a 1 in 119 gradient from the south over 3 miles takes the line to 340 feet (100 m) above sea level. This route opened for coal traffic on 15 April 1857, goods on 4 May and passengers on 8 May and the section between Leicester and Bedford is still part of the Midland Main Line. While this took some of the pressure off the route through Rugby, the GNR insisted that passengers for London alight at Hitchin, buying tickets in the short time available, to catch a GNR train to finish their journey. James Allport arranged a seven-year deal with the GN to run into Kings Cross for a guaranteed £20,000 a year (equivalent to £1,870,000 in 2018). Through services to London were introduced in February 1858. This line met with similar capacity problems at Hitchin as the former route via Rugby, so a new line was constructed from Bedford via Luton to St Pancras which opened on 1 October 1868. The construction of the London extension cost £9 million (equivalent to £795 million in 2018). As traffic built up, the Midland opened a new deviation just north of Market Harborough railway station on 26 June 1885 to remove the flat crossing of the Rugby and Stamford Railway. Plans by the Midland Railway to build a direct line from Derby to Manchester were thwarted in 1863 by the builders of the Buxton line who sought to monopolise on[clarification needed] the West Coast Main Line. In 1870 the Midland Railway opened a new route from Chesterfield to Rotherham which went through Sheffield via the Bradway Tunnel. The mid-1870s saw the Midland line extended northwards through the Yorkshire Dales and Eden Valley on what is now called the Settle–Carlisle Railway. Before the line closures of the Beeching era, the lines to Buxton and via Millers Dale during most years presented an alternate (and competing) main line from London to Manchester, carrying named expresses such as The Palatine and the "Blue Pullman" diesel powered Manchester - London service ( the " Midland Pullman"). Express trains to Leeds and Scotland such as the Thames–Clyde Express mainly used the Midland's corollary Erewash Valley line, returned to it then used the Settle–Carlisle line. Expresses to Edinburgh Waverley, such as The Waverley travelled through Corby and Nottingham. Most Leicester-Nottingham local passenger trains were taken over by diesel units from 14 April 1958, taking about 51 minutes between the two cities. When the Great Central Main Line closed in 1966, the Midland became the only direct main-line rail link between London and the East Midlands and parts of South Yorkshire. The Beeching cuts and electrification of the West Coast Main Line brought an end to the marginally longer London–Manchester service via Sheffield. In 1977 the Parliamentary Select Committee on Nationalised Industries recommended considering electrification of more of Britain's rail network, and by 1979 BR presented a range of options that included electrifying the Midland Main Line from London to Yorkshire by 2000. By 1983 the line had been electrified from Moorgate to Bedford, but proposals to continue electrification to Nottingham and Sheffield were not implemented. The introduction of the High Speed Train (HST) in May 1983, following the Leicester area resignalling, brought about an increase of the ruling line speed on the fast lines from 90 miles per hour (140 km/h) to 110 miles per hour (180 km/h). Between 2001 and 2003 the line between Derby and Sheffield was upgraded from 100 miles per hour (160 km/h) to 110 miles per hour (180 km/h) as part of Operation Princess, the Virgin-funded CrossCountry route upgrade. In January 2009 a new station, East Midlands Parkway, was opened between Loughborough and Trent Junction, to act as a park-and-ride station for suburban travellers from East Midlands cities and to serve nearby East Midlands Airport. Most recently 125 miles per hour (201 km/h) running has been introduced on extended stretches. Improved signalling, increased number of tracks and the revival of proposals to extend electrification from Bedford to Sheffield are underway. Much of this £70 million upgrade, including some line-speed increases, came online on 9 December 2013 (see below). Network Rail published a Route Utilisation Strategy for freight in 2007; over the coming years a cross-country freight route will be developed enhancing the Birmingham to Peterborough Line, increasing capacity through Leicester, and remodelling Syston and Wigston junctions. Bridges over the Midland Main Line have been replaced to allow greater clearances for electrification and larger rolling stock. Before (top) and after (bottom) the 2014 upgrade. Traffic levels on the Midland Main Line are rising faster than the national average, with continued increases predicted. In 2006 the Strategic Rail Authority produced a Route Utilisation Strategy for the Midland Main Line to propose ways of meeting this demand; Network Rail started a new study in February 2008 and this was published in February 2010. After electrification, the North Northamptonshire towns (Wellingborough, Kettering and Corby) are planned to have an additional 'Outer Suburban service' into London St. Pancras, similar to the London Midland's Crewe – London Euston services to cater for the growing commuter market. North Northamptonshire is a major growth area, with over 7,400 new homes planned to be built in Wellingborough and 5,500 new homes planned for Kettering. The service will be operated by new Class 387s. Re-signalling of the entire route, expected to be complete by 2016 when all signalling will be controlled by the East Midlands signalling centre in Derby. Lengthening of platforms at Wellingborough, Kettering, Market Harborough, Loughborough, Long Eaton and Beeston stations as well as work related to the Thameslink Programme (see below). Realignment of the track and construction of new platforms to increase the permissible speed through Market Harborough station from 60 mph to 85 mph saving between 30 – 60 seconds. Re-doubling the Kettering to Oakham Line between Kettering North Junction and Corby as well as re-signalling to Syston Junction via Oakham. This will allow a half hourly London to Corby passenger service (from an infrastructure perspective) from December 2017 possibly using Class 387s, and will create additional paths for rail freight. On 16 July 2012, the Department for Transport announced plans to reconfigure the existing electrified section and to electrify most of the line by 2020 at an expected cost of £800 million. In January 2013 Network Rail expected the electrification to cost £500 million and be undertaken in stages during Control Period 5 (April 2014 – March 2019), with Bedford to Corby section electrified by 2017, Kettering to Derby and Nottingham by 2019 and Derby to Sheffield by 2020. In the Route Utilisation Strategy, Network Rail recommended the Class 801 in 10 car formations for the InterCity services, two 775 metres (848 yd) freight loops south of Bedford and between Kettering and Leicester for longer and heavier freight services, additional infrastructure to accommodate additional freight and passenger train paths and also recommended an additional stop at Kettering for the semi-fast London-Sheffield service. The electrification plan was part of the wider Electric Spine project to create an electrified route from the Port of Southampton to Sheffield and possibly Doncaster. The project planned to electrify the Varsity Line (Bedford – Oxford), the Cherwell Valley/Great Western Main Lines (Oxford/Aynho Junction – Reading) and the Reading to Basingstoke Line. The South Western Main Line between Basingstoke and Southampton would have been converted to overhead AC electrification from third rail DC power. The plans were put on hold in June 2015 by the Transport Secretary, Patrick McLoughlin. In September 2015, the Department for Transport announced revised completion dates of 2019 for Corby and Kettering and 2023 for the line further north to Leicester, Nottingham and Sheffield. On 20 July 2017, it was announced that the Kettering-Leicester-Nottingham/Derby-Sheffield electrification project had been cancelled and that bi-mode trains would be used on the route. The section of line between Clay Cross and Sheffield is planned to be electrified for HS2 by 2033 to enable classic-compatible services to reach Sheffield along the "M18/Eastern Route", this will leave an approximate 70 mile non-electrified "gap" between Kettering North Junction and Clay Cross. On 6 November 2017 it was announced that Carillion Powerlines had been awarded the contract by Network Rail for the electrification from Bedford to Kettering and Corby. The contract is valued at £260m. The installation of overhead catenary is due to be completed by December 2019. A separate contract was awarded at the same time to the same company for £62m track upgrades on the same route. The first overhead line mast was installed in November 2017. On 26 February 2019 Andrew Jones, Parliamentary Under Secretary of State for Transport, announced that electrification would be extended northwards from Kettering to Market Harborough, enabling the connection of the railway to a new power supply point at Braybrooke. The Thameslink Programme has lengthened the platforms at most stations south of Bedford to 12-car capability. St Pancras, Cricklewood, Hendon and Luton Airport Parkway were already long enough, but bridges at Kentish Town mean it cannot expand beyond the current 8-car platform length. West Hampstead Thameslink has a new footbridge and a new station building. In September 2014 the current Thameslink Great Northern franchise was awarded and trains on this route are currently operated by Thameslink. In 2018 the Thameslink network will expand when some Southern services are merged into it. In 2013/14 Nottingham station was refurbished and the platforms restructured. As part of Wellingborough's Stanton Cross development, Wellingborough station is to be expanded. Ilkeston between Nottingham and Langley Mill was opened on 2 April 2017. Brent Cross Thameslink between Cricklewood and Hendon as part of the Brent Cross Cricklewood development in North London. Wixams between Flitwick and Bedford as part of the new town just outside Bedford. Expected to be built by 2015 but now scheduled for 2019. Clay Cross between Chesterfield and Ambergate/Alferton. Irchester (Rushden Parkway) between Wellingborough and Bedford. Ampthill between Bedford and Flitwick. The term Midland Main Line has been used from the late 1840s to describe any route of the Midland Railway on which express trains were operated. It is first recorded in print in 1848 in Bradshaw’s railway almanack of that year. In 1849 it begins to be mentioned regularly in newspapers such as the Derby Mercury. In 1867 the Birmingham Journal uses the term to describe the new railway running into St Pancras railway station. 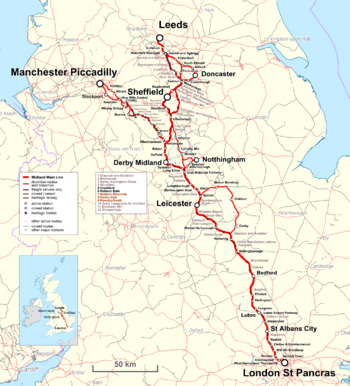 In 1868 the term was used to describe the Midland Railway main route from North to South through Sheffield and also on routes to Manchester, Leeds and Carlisle. Under British Rail the term was used to define the route between St Pancras and Sheffield, but in more recent times, Network Rail has restricted it in its description of Route 19 to the lines between St. Pancras and Chesterfield. The principal operator is East Midlands Trains, which operates 5 InterCity trains every hour from London St Pancras with two trains per hour to Nottingham and Sheffield and one train per hour to Corby. EMT use Class 222 Meridian trains in various carriage formations for most of its InterCity services. Traditional 8 coach HSTs are used for its Nottingham fast service as well morning/evening Leeds services. Thameslink provides frequent, 24-hour commuter services south of Bedford under the name of Govia Thameslink Railway (GTR) as part of its Thameslink route to London Bridge, Gatwick Airport, Brighton and Sutton, using 8-car and 12-car electric Class 700 Desiro City trains. CrossCountry runs half-hourly services between Derby and Sheffield on its route between the South West and North East, and hourly services from Nottingham to Birmingham and Cardiff. Northern runs an hourly service to Leeds from Nottingham via Alferton and Barnsley. Other operators include TransPennine Express in the Sheffield area. The cities, towns and villages currently served by the MML are listed below. Stations in bold have a high usage. This table includes the historical extensions to Manchester (where it linked to the West Coast Main Line) and Carlisle (via Leeds where it meets with the 'modern' East Coast Main Line). Network Rail groups all lines in the East Midlands and the route north as far as Chesterfield and south to London as route 19. The actual line extends beyond this into routes 10 and 11. Langley Mill Langley Mill, Derbyshire grid reference SK449470 1847 2 0.116 Erewash Valley and Trent Nottingham lines rejoin south of Langley Mill. 3 1.731 Trent Junction to Clay Cross via Derby and Erewash Valley lines rejoin together south of Chesterfield. Major civil engineering structures on the Midland Main Line include the following. Line-side train monitoring equipment includes hot axle box detectors (HABD) and wheel impact load detectors (WILD) ‘Wheelchex’, these are located as follows. The line was once the Midland Railway's route from London St Pancras to Manchester, branching at Ambergate Junction along the Manchester, Buxton, Matlock and Midlands Junction Railway, now known as the Derwent Valley line. In days gone by, it featured named expresses such as The Palatine. Much later in the twentieth century, it carried the Midland Pullman. This line was closed in the 1960s between Matlock and Buxton, severing an important link between Manchester and the East Midlands, which has never been satisfactorily replaced by any mode of transport. A section of the route remains in the hands of the Peak Rail preservation group, operating between Matlock and Rowsley to the north. For marketing and franchising, this is no longer considered part of the Midland Main Line: see Settle–Carlisle Railway. A geographical representation of the aborted Midland Main Line diversion through the West Riding, which would have put Bradford on a through line and provided a direct connection to Scotland. (Existing lines shown in black and the diversion in red). World War I prevented the Midland Railway from finishing its direct route through the West Riding to join the Settle and Carlisle (which would have cut six miles from the journey and avoided the need for reversal at Leeds). The first part of the Midland's West Riding extension from the main line at Royston (Yorks.) to Dewsbury was opened before the war. However, the second part of the extension was not completed. This involved a viaduct at Dewsbury over the River Calder, a tunnel under Dewsbury Moor and a new approach railway into Bradford from the south at a lower level than the existing railway (a good part of which was to be in tunnel) leading into Bradford Midland (or Bradford Forster Square) station. The 500 yards (460 m) gap between the stations at Bradford still exists. Closing it today would also need to take into account the different levels between the two Bradford stations, a task made easier in the days of electric rather than steam traction, allowing for steeper gradients than possible at the time of the Midland's proposed extension. Two impressive viaducts remain on the completed part of the line between Royston Junction and Dewsbury as a testament to the Midland's ambition to complete a third direct Anglo-Scottish route. The line served two goods stations and provided a route for occasional express passenger trains before its eventual closure in 1968. The failure to complete this section ended the Midland's hopes of being a serious competitor on routes to Scotland and finally put beyond all doubt that Leeds, not Bradford, would be the West Riding's principal city. Midland trains to Scotland therefore continued to call at Leeds before travelling along the Aire Valley to the Settle and Carlisle. From Carlisle they then travelled onwards via either the Glasgow and South Western or Waverley Route. In days gone by the line enjoyed named expresses such as the Thames–Clyde Express and The Waverley. Here is the Worth Valley Branch junction to Oxenhope. ^ "East Midlands RUS Loading Gauge" (PDF). Network Rail. p. 55. Retrieved 21 August 2010. ^ a b "Route 19 Midland Main Line and East Midlands" (pdf). Retrieved 10 August 2016. ^ "The Railway between Nottingham and Derby". Stamford Mercury. British Newspaper Archive. 7 June 1839. Retrieved 5 July 2016. ^ "Midland Counties Railway". Leicester Chronicle. British Newspaper Archive. 9 May 1840. Retrieved 5 July 2016. ^ "A Midland Railway chronology>Incorporation and expansion". The Midland Railway Society. 1998. Archived from the original on 28 December 2008. ^ a b UK Retail Price Index inflation figures are based on data from Clark, Gregory (2017). "The Annual RPI and Average Earnings for Britain, 1209 to Present (New Series)". MeasuringWorth. Retrieved 27 January 2019. ^ a b Leleux, Robin. A Regional History of the Railways of Great Britain. Volume 9. David & Charles, Newton Abbot. p. 92. ISBN 0715371657. ^ "Opening of the Leicester and Hitchin Line". Bedfordshire Mercury. British Newspaper Archive. 9 May 1857. Retrieved 5 July 2016. ^ Davies, R.; Grant, M.D. (1984). Forgotten Railways: Chilterns and Cotswolds. Newton Abbot, Devon: David St John Thomas. ISBN 0-946537-07-0, p. 110-111. ^ "A Midland Railway chronology>London extension". The Midland Railway Society. 1998. Archived from the original on 28 December 2008. ^ Barnes, E. G. (1969). The Rise of the Midland Railway 1844–1874. Augustus M. Kelley, New York. p. 308. ^ Railway Magazine June 1958. p. 432. ^ Railway Electrification. British Railways Board (Central Publicity Unit). Winter 1979. pp. 0–2, 8. ^ "East Midlands Parkway – Our greenest station to open on 26 January" (Press release). East Midlands Trains. 14 January 2009. ^ "Midland Main Line celebrates at 125mph". Rail News. Retrieved 20 July 2017. ^ "Route Utilisation Strategy > Freight". Network Rail. ^ "Midland Main Line / East Midlands Route Utilisation Strategy". Strategic Rail Authority. Retrieved 29 August 2008. ^ "East Midlands Route Utilisation Strategy". Network Rail. February 2010. Retrieved 29 August 2008. ^ "Midlands line 'to be electrified'". BBC News Online. 14 July 2012. Retrieved 14 July 2012. A £500m scheme … Transport Secretary Justine Greening is set to outline plans to complete the electrification of the route from Sheffield to London on Monday. ^ "Working Group 4 – Electrification Strategy". Network Rail. Retrieved 27 September 2009. ^ Barton, Tom (17 March 2014). "Developers taking too long to build homes, MP says". BBC News Online. Retrieved 21 March 2014. ^ "Kettering East: Compromise deal agreed over funding". BBC News Online. 13 March 2013. Retrieved 21 March 2014. ^ Broadbent, Steve (19 February 2014). "Switching on the Electric Spine". RAIL. No. 742. pp. 69–75. ^ "Midland Main Line 2010 route plan" (PDF). Network Rail. Network Rail. 2010. Retrieved 8 November 2017. ^ "Secretary of State opens Network Rail control centre" (Press release). Network Rail. Archived from the original on 26 September 2008. Retrieved 29 August 2008. ^ "Plans for £150m station facelift". BBC News Online. London. 6 March 2008. ^ Department for Transport (26 July 2011). "Access for all – stations". GOV.UK. Retrieved 11 April 2014. ^ a b Rail Magazine. Issue 742. 19 February – 4 March. pp. 69–75. ^ "Second Corby to Kettering railway track to be restored". BBC News Online. London. 6 February 2014. ^ "Investing in rail, investing in jobs and growth" (Press release). Department for Transport. 16 July 2012. Retrieved 11 April 2014. ^ "Network Rail to spend £500m electrifying Midland Mainline". BBC News. 8 January 2013. ^ Rail Magazine. issue 729. 2013. p. 6. ^ "Today's House of Commons debates – Thursday 25 June 2015: Network Rail". UK Parliament. Retrieved 25 June 2015. ^ "TransPennine and Midland Mainline electrification works to resume" (Press release). Department for Transport. 30 September 2015. ^ "Electrification of train lines to be restarted by Network Rail". BBC News. 30 September 2015. ^ "Sheffield, Swansea and Windermere electrification cancelled". Railway Gazette. 20 July 2017. ^ "HS2 Update". Hansard Online. 627. 17 July 2017. Retrieved 8 November 2017. ^ "Network Rail awards MML electrification and upgrade contract". Global Rail News. 6 November 2017. ^ "Electrification to reach Market Harborough". Railway Gazette. 5 March 2019. ^ "Wellingborough railway station expansion plan unveiled". BBC News. 18 April 2012. Retrieved 23 August 2013. ^ "Wait finally over for Ilkeston train station as hundreds turn up to opening". Nottingham Post. 2 April 2017. Retrieved 7 May 2017. ^ "Route Specifications 2015 - London North Eastern and East Midlands" (PDF). Network Rail. Network Rail. April 2015. Retrieved 10 August 2016. ^ "Connecting Communities – Expanding Access to the Rail Network" (PDF). London: Association of Train Operating Companies. June 2009. p. 9. Retrieved 7 September 2018. ^ ATOC 2009, p. 19. ^ Bedfordshire Ampthill station Archived 13 May 2008 at the Wayback Machine, Railway & Transport Association. Retrieved 4 January 2010. ^ Bradshaw, George (1848). Bradshaw’s railway almanack, directory, shareholders’ guide and manual. George Bradshaw. p. 204. ^ "The Leeds and Bradford". Derby Mercury. British Newspaper Archive. 15 August 1849. Retrieved 10 August 2016 – via British Newspaper Archive. (Subscription required (help)). ^ "The New Works of the Midland Railway Company". Birmingham Journal. British Newspaper Archive. 21 December 1867. Retrieved 10 August 2016 – via British Newspaper Archive. (Subscription required (help)). ^ "The New Midland Railway Station at Sheffield". Sheffield Independent. 12 December 1868. Retrieved 10 August 2016 – via British Newspaper Archive. (Subscription required (help)). ^ "New cutting-edge trains in full operation across Thameslink route". mynewsdesk.com. Mynewsdesk. 18 September 2017. Retrieved 8 November 2017. ^ a b Bridge, Mike (2013). Railway Track Diagrams Book 4 Midlands & North West. Bradford on Avon: Trackmaps. pp. 1–5. ISBN 978-0-9549866-7-4. ^ a b Brailsford, Martyn (2016). Railway Track Diagrams Book 2: Eastern. Frome: Trackmaps. pp. 1, 27. ISBN 978-0-9549866-8-1. ^ "London North Eastern Route Sectional Appendix; LOR LN3201 Seq001 to 030" (pdf). Network Rail. Retrieved 2018-01-13. ^ "Railway Codes: HABD and WILD equipment". Wikimedia Commons has media related to Midland Main Line.